the Evolving and blending of musical styles of African and European cultures in the 19th century became the basis for a new and rather unique direction, which almost immediately received the name "jazz". 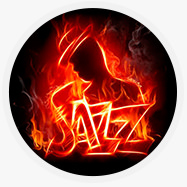 Jazz began to be called Union Blues native African motifs with ragtime. And in the beginning all that could be attributed to the jazz, was a complete improvisation. However, improvisation remains today an important feature of jazz. Musician playing jazz and creating a sound representation of his soul, should first turn to follow the rhythm, timbre and harmonic. But it is much better when played sounds for the first time – then it becomes really sincere jazz creativity. After just a few years after its inception, jazz very seriously declared itself in the lands of the United States. It brought black slaves from Africa, whose music became a permanent resident of isolated urban areas called "ghettos". It is from such ghettos jazz and subsequently stepped onto the world stage. However, this was still not the jazz that you hear today. Newborn musical style has evolved, incorporated new sounds, combines other types of folk art and folk music in particular, and prison song. But the more popular was jazz music in the country, the more it came to musicians, able to play professionally. And, of course, that the music of African Americans required a certain level of respect. So jazz has become one of the compelling reasons that led to the liberation of the race from devalued status in society. And in order to free the musicians could Express themselves, and their works became available to the masses, there are special first recording studios. However, even the presence of professional jazz singers and musicians for a very long time could not bring jazz outside of folklore. a Landmark event that has made jazz music a new world culture occurred in the 60-ies of the 20th century. Important role here was played by the emergence of jazz compositions based on classical music. And include such work of Oliver Nelson, who made his first jazz cover version on the work of Sergei Prokofiev's "Peter and the wolf". And special love from jazz musicians enjoyed the music of Richard Wagner. It is very dramatic in the arrangements, however, observing all the canons of jazz. Today, jazz is more than 30 kinds of different directions, where each style has its own characteristics and rules of performance. However, this does not reduce the number of jazz lovers from both the musicians and the listeners. However, jazz is hardly popular music, yet it has its lovers and followers. as for the jazz, but now it is often played by blacks, not only blacks, but people from other continents and ethnic groups. But the need to play jazz in the team – remained. Because, no matter how talented was not a separate jazz musician, but the collective work in the Union, so-called, the jazz band allows you to show the versatility and depth of this wonderful style.